A long time ago I raved about how awesome Windows 7 was compared to past operating systems. It turned out that my installation did have one fatal flaw that I dealt with for a little over a year. The graphics driver that I had managed to get to install caused crashes and blue screens when I switch from docked to undocked while in hibernate or sleep state. 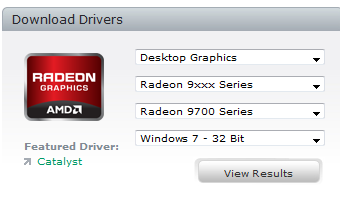 Download the Catalyst “Legacy” Display Driver off http://ati.amd.com/ Select: “Desktop Graphics”, “9xxx Series”, “9700 Series”, “Windows 7 – X Bit”. Download Mobility Modder http://www.hardwareheaven.com/modtool.php and then follow the instructions. The hardest part was trying to figure out what options to enter on AMD/ATI’s website to make them give me the right catalyst suite. Once that was done the rest is easy. Now my laptop docks and undocks with no glitches.